Today's Inside Out Beauty Food is...drumroll...the wonderful, the magical, the beautiful...sweet potato! You've no doubt heard of and tasted this delicious root vegetable. Maybe it's even a part of your regular diet. I'm so happy sweet potatoes have gone from something we drenched in marshmallows, brown sugar, and butter on the holidays to a more savory everyday food. Not that I have anything against this Thanksgiving day favorite - my sister, Carrie, makes a mean marshmallow-covered sweet potato dish! But, I am happy it has moved into our day-to-day repertoire (in healthier versions, to boot). Sweet potatoes are full of health, and beauty-boosting benefits. If their color is any indication, they are full of beta carotene - the same phytonutrient found in carrots. And by eating them on a regular basis, your skin will literally develop a sun-kissed glow. Since today's Inside Out Beauty Food focus is on hydration of the skin, let's delve into why sweet potatoes are total badasses in the hydration department. - They are a rich source of Vitamin C, which helps our cells produce collagen. Collagen helps with our body's natural ability to promote skin plumpness and elasticity. - Antioxidants found in sweet potatoes - aka beta carotene, aka vitamin A - prevent oxidation and premature aging from a cellular level. This means that not only do we get beauty benefits like youthful skin (on the outside), but we are also preventing cancer (on the inside). The antioxidants, specifically beta carotene, also help our skin to protect itself against damaging UV exposure. It provides an internal layer of protection from harmful UV rays, while allowing us to still absorb the sun's vitamin D benefits. - A rich source of magnesium, sweet potatoes are also what's know as a "grounding," anti-stress food. They, of course, grow in the ground and metaphorically have the same effect for us on an energetic level. Because of this, they make a wonderful addition to your dinners - the magnesium and starch will help you sleep. Sound sleep makes for a rested, restored, revitalized complexion. Sweet potatoes are wonderful for bringing a vata individual back into balance. The properties help calm and stabilize this dosha's airy, ether tendencies. The good sleep that starchy root vegetables and complex carbohydrates (like sweet potatoes) promote, boosts serotonin production, leading to an overall feeling of contentment. - Vitamin E is a wonderful aid to skin hydration and suppleness. It's no surprise it's found in sweet potatoes! In particular, the combination of vitamins A, C, and E are like the holy trinity of beauty vitamins for the skin. - Sweet potatoes are high in fiber and manganese, and while this may seem unrelated to skin, it's not. Both of these properties help with blood sugar regulation, feeling full, and prevent over-eating. When we feel satiated and content with our food, we're less likely to reach for beauty-busting comfort foods. 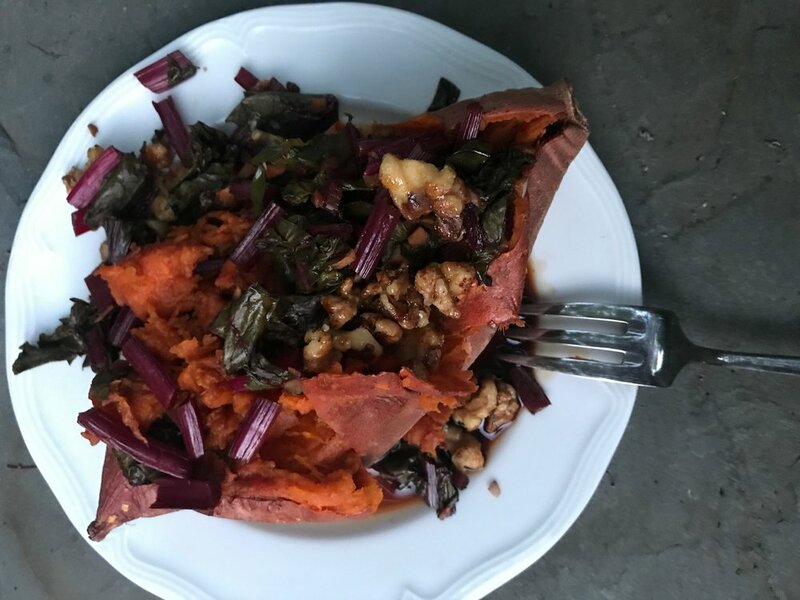 - Because sweet potatoes are a great source of iron, which supports our bodies production of red and white blood cells, they support our immune system and also keep our blood healthy and oxygenated. When we support our circulation, we support our skin's radiance! - Sweet potatoes are phytoestrogenic, meaning they usher out unusable, cancer-causing estrogen that can interfere with our hormone function. In today's world, we are constantly bombarded with potentially-harmful, endocrine-disrupting estrogens, in the form of plastics, pharmaceuticals, and environmental toxins, as well as our body's own production possibly being out of balance. Sweet potatoes help pull us back into balance. Balanced estrogen is muy bueno for your skin! And imbalanced estrogen is muy...not bueno. Know this - you do not want unused hormones hanging out in your body - they are major health, and beauty busters. Because of sweet potato's hydrating powers for the skin, it also means they are great for any kind of dry skin imbalance like dandruff, eczema, psoriasis. Adding sweet potatoes to your diet will, over time, improve the shine and luster of your hair. 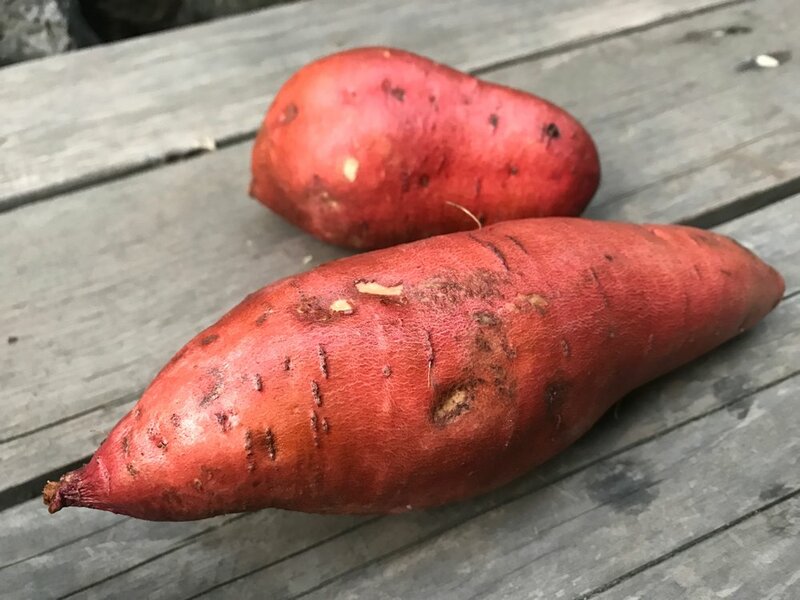 Even though sweet potatoes have "sweet" in the name, they are actually lower on the glycemic index than regular potatoes, and help stabilize blood sugar. In fact, sweet potatoes have the green light for diabetics. Hurray! 1. Eat the skin! Sweet potato skins are rich in fiber and potassium. Make sure to buy organic for minimal chemical and pesticide exposure and maximum nutrient content. 2. Low-cost meal: organic and healthy food often gets a bad rap for being more expensive. 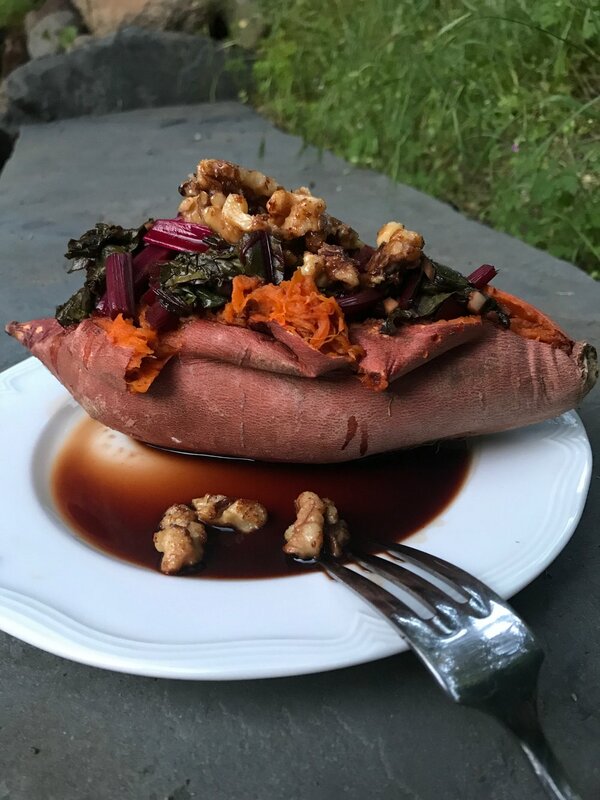 And while, of course, quality, organic ingredients are oftentimes more expensive than their conventional counterparts, sweet potatoes can make a filling and inexpensive meal. While I haven't priced it out, this recipe I'm about to share is no doubt cheaper than any protein-based meal I've ever made. For today's recipe, I almost did sweet potato fries - I love sweet potato fries! But on this particular evening, my body was not craving the extra oil. And since I'm a big believer in listening to our bodies (unless my body is telling my to dig into a pint of ice cream...in which case, I still listen), I let my intuition guide me and came up with what turned out to be, a deliciously comforting, complete little meal. This dish also happens to be gluten, dairy, and oil-free, and rich in so many other skin-supporting ingredients. And, as a bonus, it turned out to be the perfect excuse to use up the beet greens that I had leftover from a few nights before when I made a microgreen bowl with roasted beets. Side note: The flavors in this dish are a spin on a salad recipe from when I did the Sonoma Tuesday Night Farmers' Market back in 2015. My "Beet Greens" salad had these same walnuts plus kale, beet greens, roasted beets, goat cheese, and a balsamic dijon vinaigrette. It was always a favorite! 2. Pierce sweet potatoes several times with fork. Place in oven on middle rack. (no need to wrap in foil or coat in oil). Set timer to 40 minutes. 3. 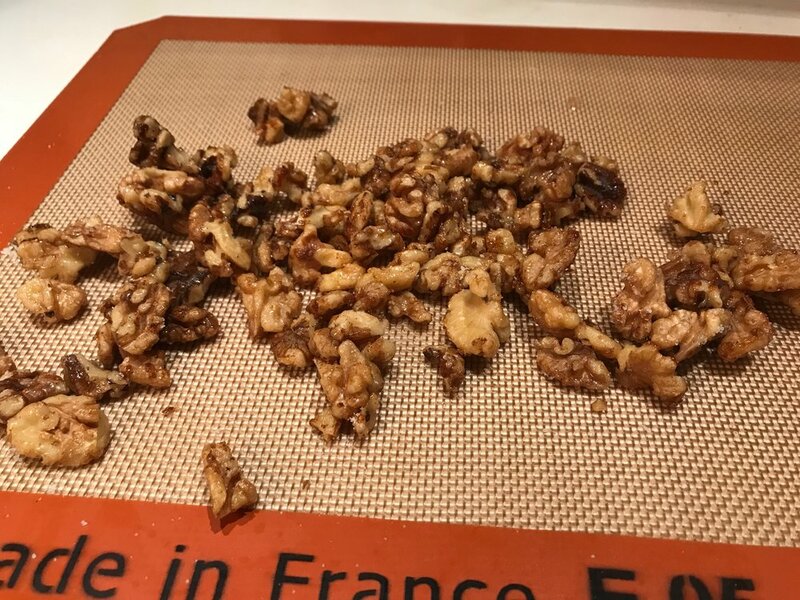 MEANWHILE, TO MAKE MAPLE CAYENNE WALNUTS: Pour maple syrup and a few dashes of cayenne pepper (reduce quantity or omit if you are sensitive to spice) into a non-stick pan over medium heat, coating the pan. Add walnuts. Let the walnuts toast, being careful that they don't burn. After several minutes, stir and flip to toast evenly. Once walnuts are toasted evenly, remove from heat and spread out onto Silpat or parchment paper. Sprinkle generously with sea salt. Let cool. * go do something fun until the potatoes are almost ready (~10 minutes remaining). Cooking the beet greens is quick and better served hot. 5. Add balsamic to a large pan over medium heat. Make sure you have a pan with a lid. Add beet greens to pan and let them cook for a few minutes, stirring frequently. Add garlic, give it another stir and put lid on pan for remaining ~3 minutes, letting it all steam together. 6. When oven timer goes off, remove sweet potatoes from the oven (careful, they're hot!). Give them a slice down the middle and then add the beet greens mixture, drizzling the extra balsamic over the whole thing. 7. Top with walnuts and sprinkle with sea salt and you're ready to serve! *This would also be great with a some crumbly goat cheese over top. Today's hydrating beauty food was picked to pair with Beautycounter's Hydrating Countermatch Collection. Buy anything through these links and you will be entered for a chance to win this awesome lipstick! For more on why I chose to do this 12-day blog series (in alignment with Beautycounter), check out my initial blog post, here.